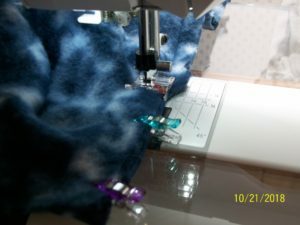 Last week I had just starting making a fleece top for the cooler fall evenings. Today was the day to finish everything, starting with inserting the sleeves. 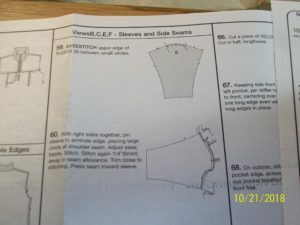 If you have always inserted sleeves by using a set-in method, I encourage you to try set­-in sleeves using a flat construction method. 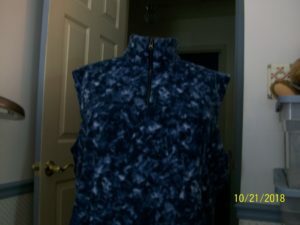 As explained in the pattern, the sleeves are sewn in before the side seams are sewn. I now always use this method, whether called for in the pattern or not, if the sleeve requires ease but no gathering. I remove my Interchangeable Dual Feed foot and replace it with my Clear Seam Guide foot. I then, increase my presser foot pressure from 3.0 to 3.5. 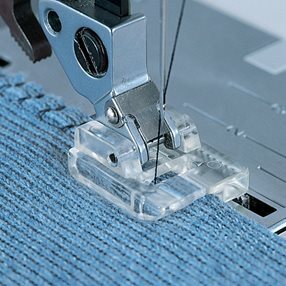 (If you are using a Pfaff machine, you would disengage the IDT system and increase the presser foot pressure up one half step). When inserting the sleeves, you will want to have the sleeve on the bottom, closest to the feed teeth. The feed teeth will ease in the extra fabric for you and, without the dual feed, will allow you to ease the sleeve without using any extra gathering stitches. Before sewing the sleeves, remember to press up the hems! After inserting both sleeves, you will have sleeves that have been eased in with no gathers or tucks in sight! I then change my presser foot ankle from a Husqvarna Viking ankle to a Pfaff ankle so I can use their Knit Edge foot to create perfect topstitching on the sleeve seams. Make sure you have pressed in the hem for the bottom of the garment and then sew the side seams from the hem up the body of the garment and through to the wrist. After the sleeves are in, finish the hems and you are done!